I’ve recently begun using Ansible and Packer to bake “Golden Image” AMIs for AWS. This makes deploying applications with Spinnaker a breeze, but testing those “BaseAMIs” is difficult. Packer is unforgiving of failed builds, unless it’s invoked with the fully-interactive --debug flag it instantly terminates failed instances (removing the option to debug a partially-converged filesystem). Testing Ansible and Packer configs with Docker makes iteration much faster. I avoid the standard Packer overhead of launching an EC2 instance, “waiting for ssh”, shutting down, creating the AMI, and all the cleanup tasks. This can save several minutes right off the bat, and combined with Docker’s filesystem cache iteration becomes much less painful. The biggest caveat to drop-in testing Configuration Management for AMIs against Docker containers is that they’re not exactly the same base installations. If I find an “ubuntu trusty” Packer source_ami from https://cloud-images.ubuntu.com/locator/, it’s not going to contain the same base installation as the image I get from docker pull ubuntu:trusty. To get a Docker Image that matches your source_ami, let’s start by finding that AMI’s snapshot-id. 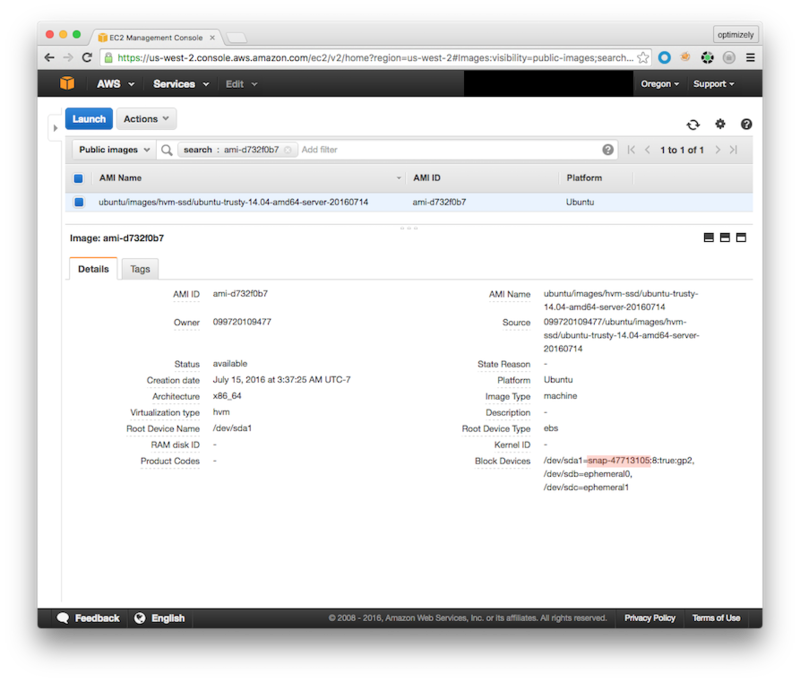 Open your AWS Console and search for the AMI you’d like to image. The Block Device Mapping for /dev/sda1 shows the EBS Snapshot containing the root filesystem for the AMI. Find that snapshot in the AWS Console, right-click and select “Create Volume”. The defaults are probably fine here, just ensure it’s in an Availability Zone where you have an existing EC2 instance. 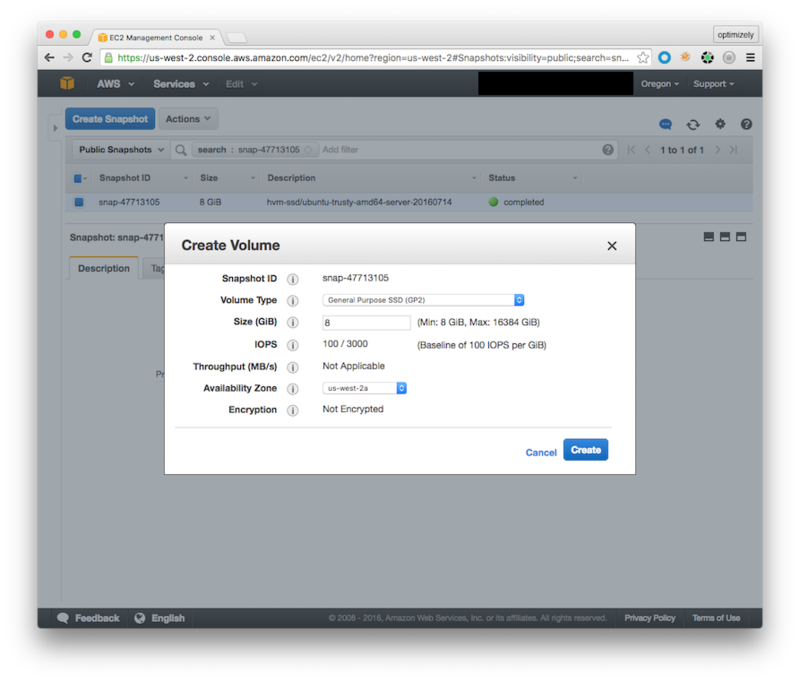 When the volume goes into state “Available”, you can right-click and select “Attach Volume” to assign it to an existing EC2 instance. Now that you have a representative base image to test, you may need to modify your Configuration Management to support execution inside a Docker container. I install a custom /etc/apt/preferences to prevent those those packages from being upgraded by apt-get upgrade. From here I can validate my base-ami/site.yml with docker build. Any errors will cause the build to fail, but subsequent runs will skip any successful stages, allowing quick iteration.